Three U.S. troops were killed in Iraq on Thursday, making April the deadliest month for U.S. servicemembers this year. Two Marines and a sailor were killed during operations against militants, according to a U.S. military news release. The military did not release the names of the troops. In April, 18 U.S. troops died in Iraq, according to a CNN count of reported troop fatalities. Sixteen of those troops died in combat. March’s nine fatalities was the lowest death toll for U.S. troops in Iraq since 2003. April was also the deadliest month this year for Iraqi civilians. At least 290 Iraqi civilians died in April, compared to 185 in March, according to an Interior Ministry official. Nearly 80 Iranian pilgrims were killed in suicide bombings last week. April has seen a rise in attacks, most of them targeting Shiites. 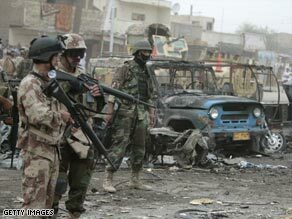 A series of suicide bombings last week killed almost 160 people and left almost 300 wounded. Six car bombings struck Shiite areas of Baghdad in the span of four hours on Wednesday, killing dozens of people and wounding more than 100 people.